So unfortunately this week, I am under the weather. I have a bazillion half finished projects lying around the house and I can't seem to muster up the energy to complete them. I foresee quite a few late nights in my future. What I can share with you is something I did manage to complete. In a few days I'm having a couple friends over for an annual small Christmas party. I wanted to give them something small to say 'Thank you for coming." 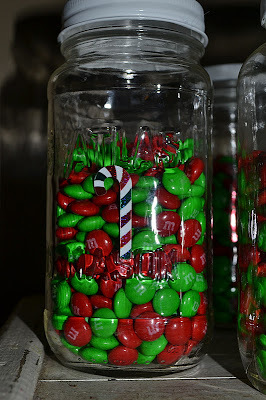 I remember seeing a great party favor on my all time favorite blog, You Are My Fave, a very long time ago. Unfortunately her site crashed awhile back, and I can't share the specific link with you, however, if you do happen to wander over to YAMF, search for 'Candy Favors are my Fave', and you will find my inspiration. I gathered 5 empty jars out of my entirely too large jar collection, and cleaned off the labels. I did this by peeling off the labels and then placing them in a pot of boiling water. I read about this somewhere on the crazy interwebs and I'm not entirely convinced it works. I should have gone to the store and bought some glue remover, or Goo Gone, but instead I scraped away at the remaining glue with rubbing alcohol, baby oil, and acetone. There are all listed online as at home glue removers. It took a really long time, so I definitely recommend buying glue remover. Next I spray painted the lids all the same color. 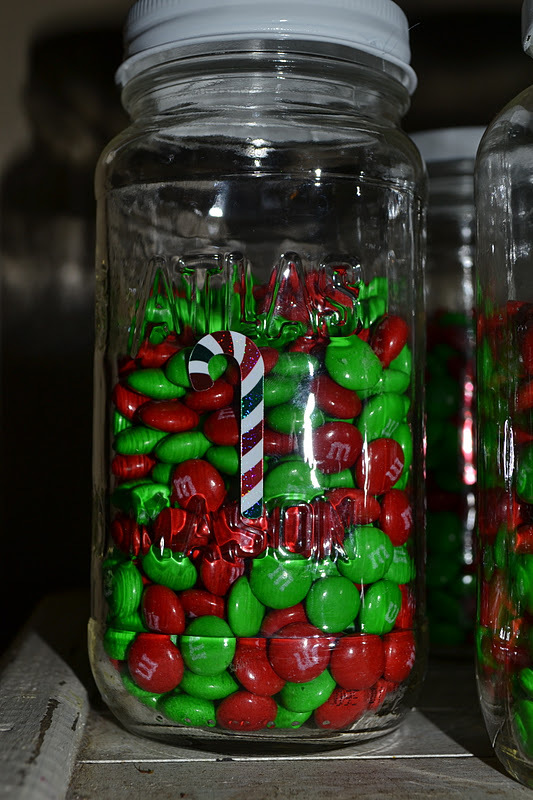 As that dried, I filled the jars with holiday m & m's. 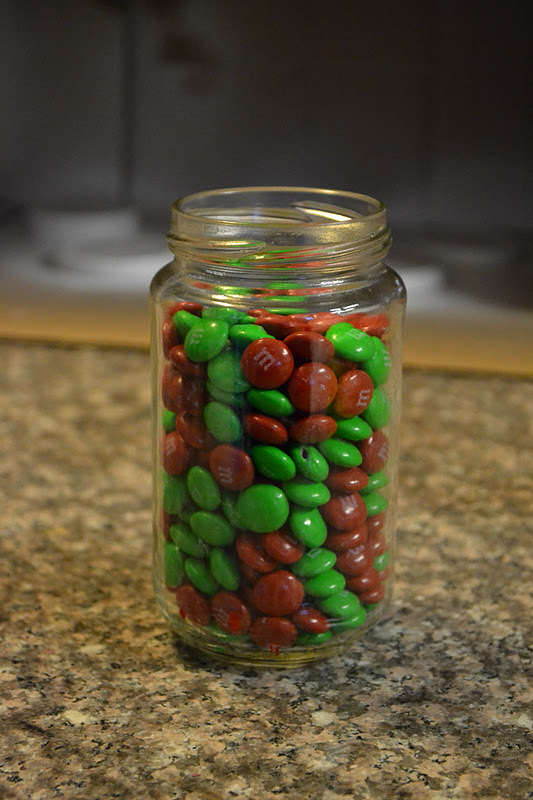 I bought 5 bags of candy and it still didn't fill each jar 100% full so I just leveled them out the best I could, and put a cute sticker on the jar. Easiest craft ever. Now when all my fine lady friends head out after our evening of giggles and white elephant exchanges, they'll be able to take something sweet with them.